NOSE: Fairly muted. Mostly caramel and molasses. Not hop-forward at all…what little there is in the nose is more spicy and floral. TASTE: The underwhelming nose doesn’t prepare you for what is actually a delicious brew. Compared to other “Irish Reds” (think Killians) this is a bold, and complex beer. It has a roasted, sweet, well-rounded malt profile like a fresh-baked loaf of dark bread. A touch of citrus from the hops leads to a slightly drying finish. MOUTHFEEL: Medium-bodied with solid carbonation. DRINKABILITY: Easy like Sunday morning. Doesn’t overpower, but neither does it underwhelm. A clever and fast-drinking brew that serves as an excellent flagship for an excellent brewery. 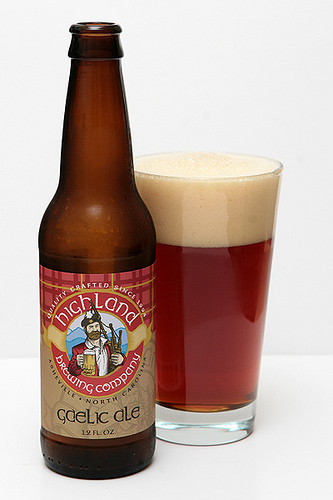 Posted in Tasting Notes.Tagged Amber Ale, Gaelic Ale, Highland, Irish Red.